Nader Al Hussein is also known as Shahid N.W.A, a Palestinian poet, story writer and hip hop artist from Lebanon. He has lived all of his life in Palestinian refugee camps in Lebanon where he was politically involved as a creative freelance writer and a member of one of the oldest and most influential Palestinian hiphop groups in Lebanon and the Middle East. Also, he was a member of a Palestinian film production group. Two years ago he moved to England for political reasons and he currently lives in Middlesbrough. He is studying his final year of Psychology at Teesside University and is preparing for a career as psychologist/ art therapist. Nader is currently a student member of British Psychological Society, Black Light Engine Room for poetry, The Teesside Palestinian Solidarity Campaign and other active groups. Lately, he along with other musicians formed the Knights of Nights band and he is currently preparing his new disc “Redeployment” in which science, politics and poetry meet in a unique hip hop album. 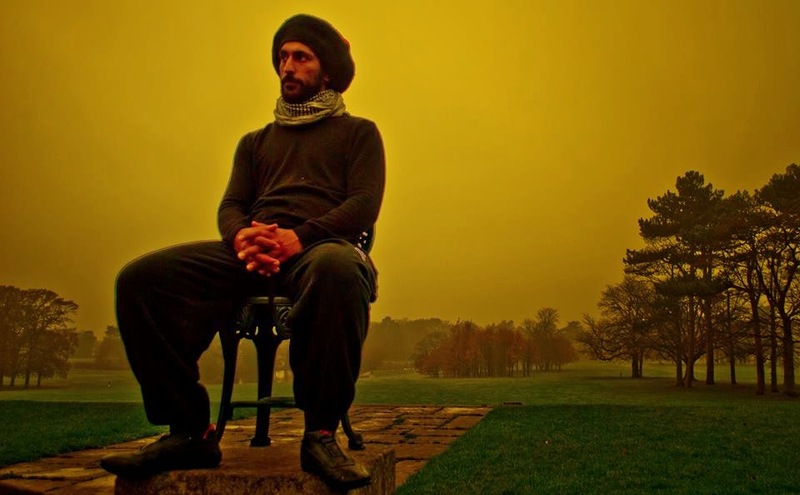 You can check his Facebook page Shahid N.W.A or his bandcamp page for more songs and news. Interview carried out by email by Jack Little. 1. You are a musician and poet. Why did you choose a creative path in life? To answer this interview, I decided to sit down and put music on in the background so I want you first of all, to thank you for this opportunity. I recommend that the reader do the same and to choose their music now of their own while reading this as I did while writing it. However, there are many details in our life that we can’t choose. I did not choose to be born, I did not choose to be Palestinian and I did not choose to be musician and poet. I did not choose my given I.D name, moreover; when I had “Shahid nwa” as a nickname (shahid mean witness and nwa stands for my i.d. name) it was given to me by my artist friends and I did not choose it either. If I had to choose a nationality from the beginning, it would be Palestinian and because I am human, I will not give up my features as a writer and poet. If all living creatures (from plants to animals) have a rhythm then mine will be music. Things sometime can happen in a simpler way than we think and for me when I pause for a moment, I think that I am glad that they happened to me in this way. 2. Please tell us about your background and how it impacts upon your creative work. I am Palestinian and I lived in a Palestinian refugee camp in Lebanon. During the first couple of years of my life, I was living in a haven because there was a siege at the camp that I was born in until people ate cats because of a lack of food and water. The country we were living in was not ours and there were a lot of wars, so my family moved a lot and I have memories of many places. For a couple of years we lived in a hotel that was destroyed in the war and because it was destroyed many refugees lived in it. My family was one of these. I have heard that the owner of the hotel, when he arrived back from his travels outside of Lebanon, a friend of his took him to stand inside his hotel and pointed to him that “this is your hotel” and the owner had heart attack and died at the scene. I was 6 years old, I bought a sweet box and I was passing back to our house in that building, a fast car hit me, I flew for a while and I recalled my past memories as photo in an album. The people were throwing water at me and asking me if I was okay. I am still surprised because of my memories that passed by in mind as if in a film. I did not find my sweet box then. They asked the people to evacuate the building later, everybody left the building, but my family stayed last. Me and my sisters discovered the others’ rooms and in one small room I saw a desk, chair, bottles, a cup and a bed. I imagined the person who used to sit there and drink without any place for other activities and maybe think and then continue his thought in his dreams in his bed. My mother suffered because she had a medical condition which was created by a sniper bullet when she was trying to get some drinking water while the siege at the camp was still on. I was two years old and we were still in the camp. After that, we returned to that Palestinian camp, which was on Lebanese land. I grew up there, I went to a United Nations school and a United Nations health clinic. They had the worst services a human can imagine. I did not like the places but I noticed the people. Everyone was a magician and created a life in different ways under such inhuman conditions. When I turned 16, I decided to become independent and to live on my own; I moved to Sabra and Shatila camp. I did well considering all the events that were happening with me and I decided with friends to start a Hip hop band and later the young people in all of the camps knew about our songs and many believed that we spoke for them. We attracted local and international media like Aljazeera and canal +. Then later, I was asked to write in a newspaper, so I wrote short stories, poetry, rap verses and theatre songs. For the past two years, I have found myself here in UK and this incident was similar to the car that hit me so I decided to start my new album here “Redeployment”. I do not think that I lost or will lose that sweet box ever. Ask my dentists! 3. Do you believe that poetry, music and art can make a significant difference to the world that we live in? It’s referred to by humans as “dust to dust”. We are passers-by in this world. Nothing stays in it but poetry, art and music. These cultural components are what one say to his partner to declare and confirm his love. These are what mothers sing to their children, the mother may leave life, the child grows, but these songs stay. These components are what soldiers listen to before sacrificing their lives in acts of resistance against illegal occupiers. These charming stories that are told to the children are their own ABC in life. What do you know about your beloved? A feeling, a song. What do you know about your Grandparents? A story. What do you have for your child? An idea, a thought, an art. 4. As a bilingual artist, what are the main differences and similarities in your work when performing in Arabic compared to English? I have been here for only two years but I lived in Arabic: got angry- happy – sad and even fought in Arabic. Also, I wrote to my beloved friends what they meant to me and what could be classified as love poetry in Arabic. I started a technique mixing Arabic Fosha and slang Arabic to link both sides of what can be classified as educated or street people and to bring to light the importance of both (to be honest I am biased towards the streets). However, with any language, when you live it, then you can perform it and I am performing in English too. Arabic is a very strong language. You know what, if you are a man, grow your beard and speak it loudly in airports and other such secure places and you might get a better idea of just how strong it is! 5. Where is "home" for you? How does this impact on your work? Beauty, art and humour are ways in life. They are built from within, we just need to bring them out and each one can do that in a very different way. For me, writing and performing have been and continue to be my friends throughout my life, but as we say in Arabic “you are my life/age” for the one we love. Palestine and the people are my life. All the money, valuables, properties and stone will not fill the feeling of mother missing her son and mourn. All the hurricanes will not shake a lover and a believer’s believes. All the stress can’t last and comfort will approach. All the irritation will calm and the time will be smooth. Millions of lonely people will discover themselves in others.